We’re gonna party like it’s 1959! 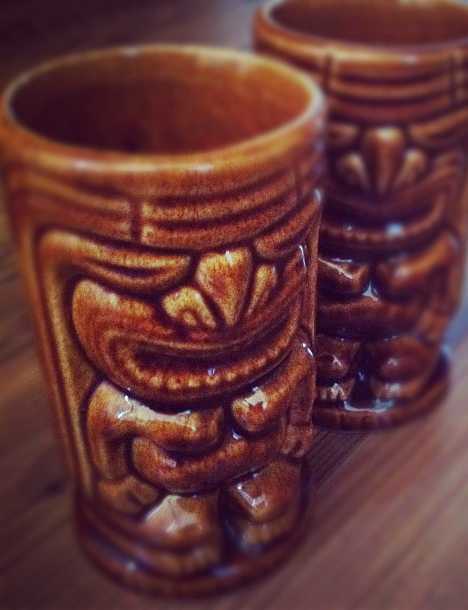 Classic ceramic mugs celebrating the South Pacific Tiki have punched up pop culture from Waikiki to Wachee Weeki. 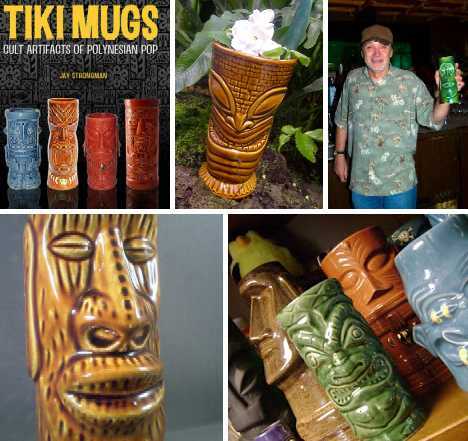 Whether serving frosty, fruity tropical cocktails or simply glowering down from a collector’s mantlepiece, Tiki Mugs embody the exotic aura of post-war Polynesia filtered through the fonder memories of battle-hardened GI’s, the escapades of surf-soaked Gidgets, and the coco-nutty fantasies of armchair Gilligans. 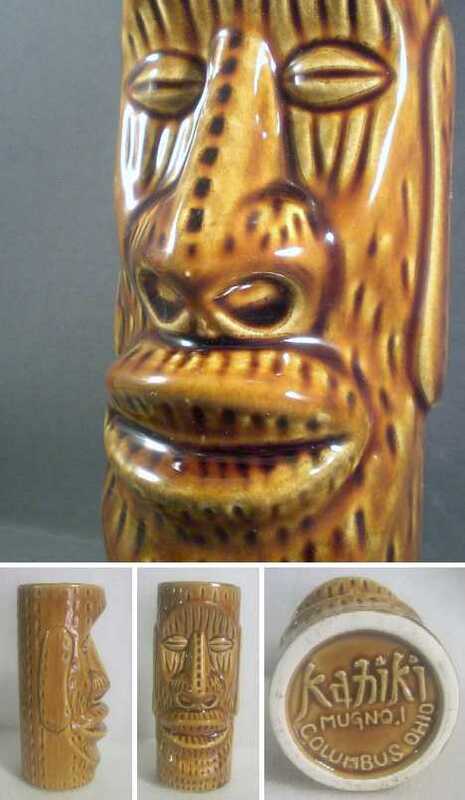 The tiki mug above appears to be an hourglass-shaped design by Daga that displays all the expected south-seas styling cues (fearsome face, glazed wood look, etc) along with the advantage of being skillfully and creatively photographed. 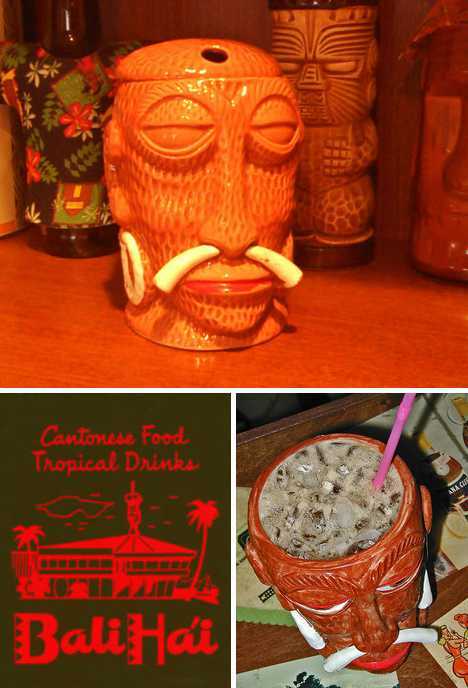 Thanks to A Mountain of Crushed Ice, who not only know their way around a tiki mug but also exhibit due respect for the tiki drink in all its glory. 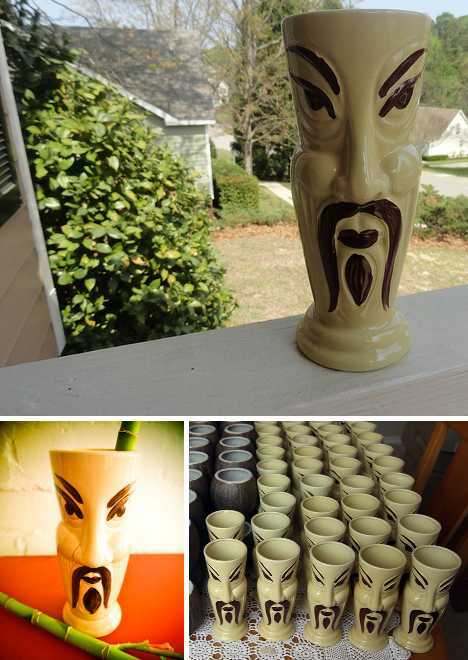 With a nod to Frank Black, we salute the Fu Manchu style tiki mug. 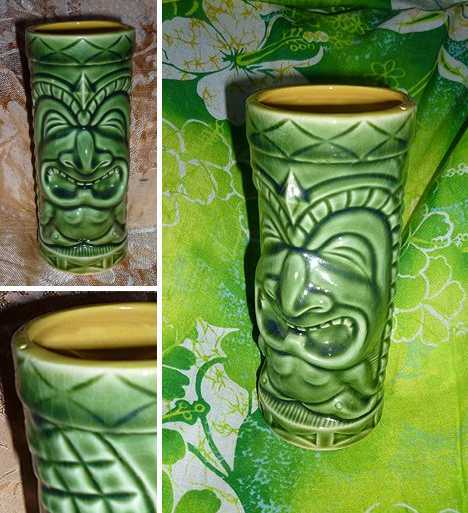 Though possibly politically incorrect when viewed few the prism of modern societal norms and mores, the original Orchids of Hawaii, made-in-Japan, Fu Manchu Hi-Ball R-82 mug may have lacked traditional tiki design cues but benefits from long years of service at a variety of tiki bars, polynesian restaurants and south-sea themed watering holes. Who was “Leilani” and who would name a tiki mug after her? Probably someone who could run faster than a thrown tiki mug. 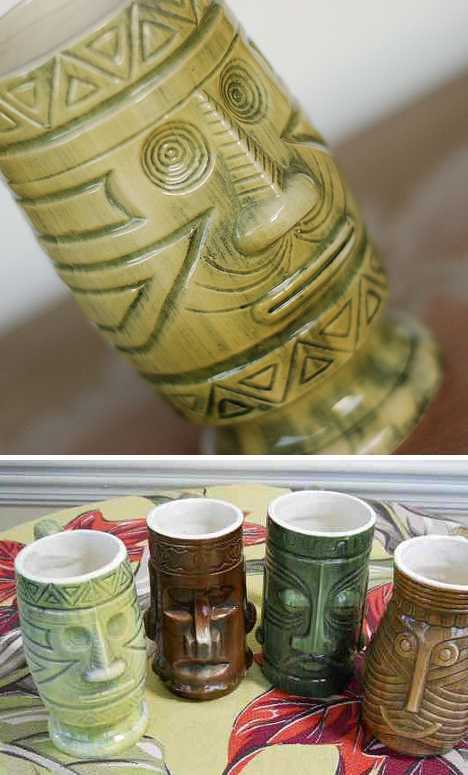 Short, stout, and apparently “much maligned by collectors” due to their mass-production commonality, vintage Tiki Leilani mugs offer good things in their small packages: bold pseudo-Hawaiian styling, high-relief castings, rich brown glazing and a smile that’s to die for. Otagiri Mercantile Company, or OMC for short, was a Japanese-based manufacturer of ceramic tiki mugs, bowls and other kitchenware items. 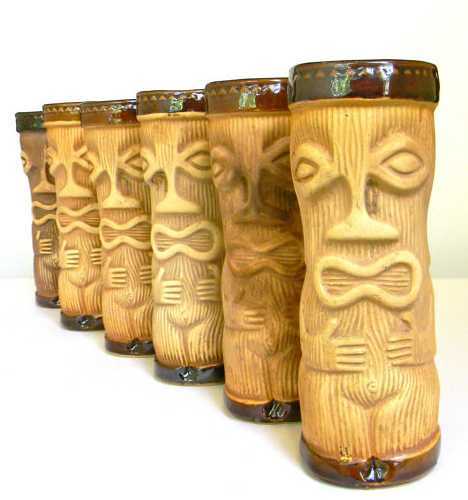 Their mid-1960s tiki mugs are popular collectibles that have stood the test of time. The “Maori Tattoo” mug above is one of OMC’s better-known patterns, distinguished by a detailed matte-finished body sandwiched between a dark, wood-like base and rim. 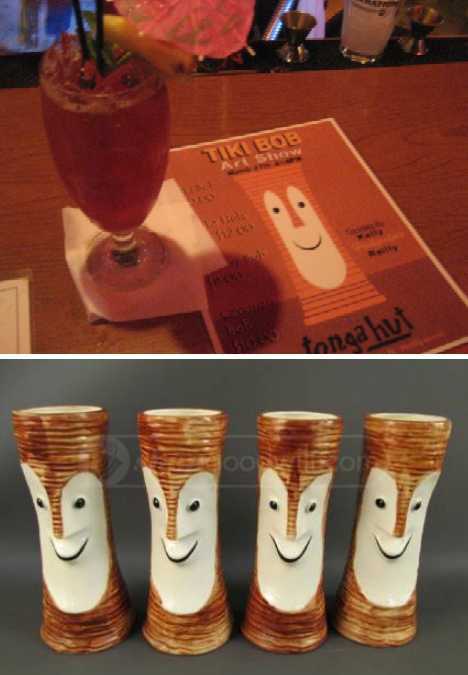 What’s the deal with Tiki Bob mugs, anyway? The proto-happyface smile is anything but traditionally toothy and the pale-faced plainness of the design somehow doesn’t seem tiki-ish at all. 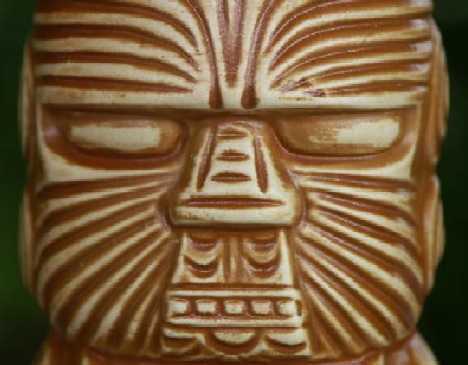 Bob’s got one thing going for him, however: many consider “him” to be the first mass-produced tiki mug. Better known as “Mr. Bali Hai”, this multi-toned (and multi-boned) heads-up display is tough to find complete with its mildly macabre twin-straw-hole skullcap. Sort of a Indiana Jones’ Temple of Doom meets Gilligan’s Island thing, with a dash of Night of the Living Dead thrown in for good measure. Could this be the Polynesian fertility goddess? The big round belly and burgeoning breasts scream “female!” and the contorted facial features just scream, period… and by “period”, we don’t mean anything in particular. 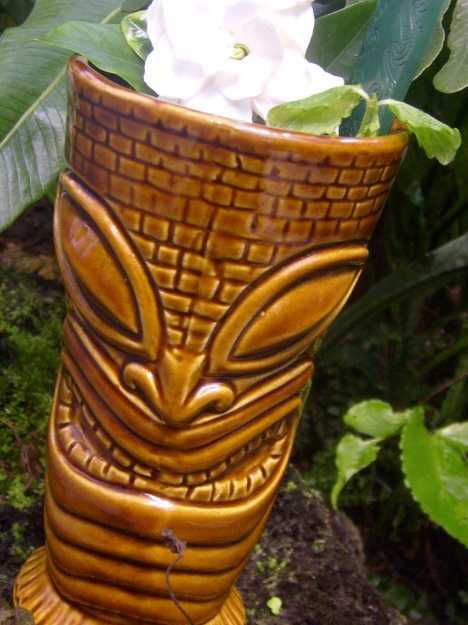 Originally made-in-Japan by Orchids of Hawaii, these model R76 tiki mugs purport to depicting “Lono, the God of Peace and Prosperity,” and are almost as scary as your mother-in-law in a grass skirt. 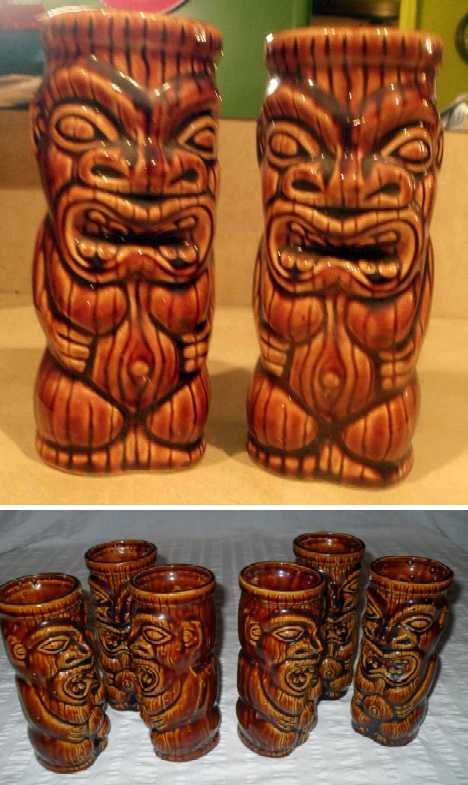 The Westwood company imported tiki mugs in large and small sizes between 1960 and 1975. Often featuring coffee-cup style handles, Westwood’s offerings were typically lightweight due to thin-wall casting and their designs tend to be low-relief with minimalist graphics. 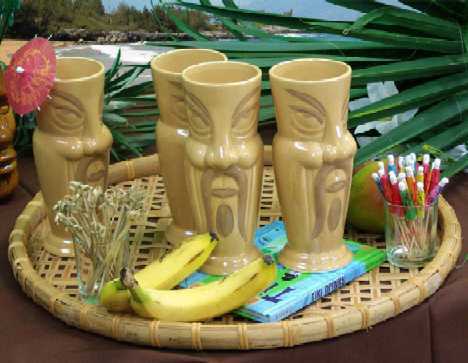 Westwood tiki mugs are popular due to their wide range of bright colors that add life to many tiki mug displays. 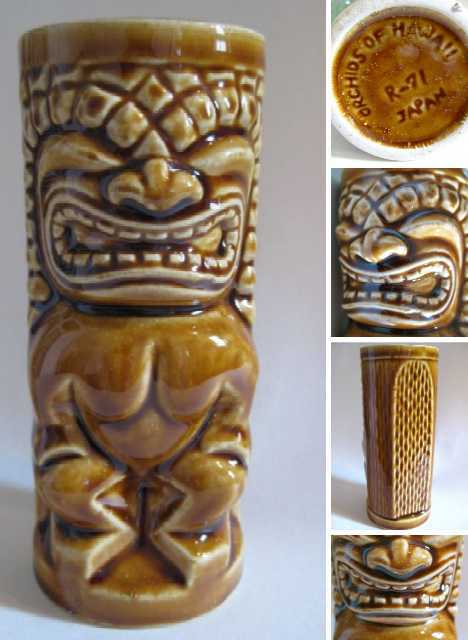 Sometimes called the “Praying Tiki” mug as when viewed from behind it the tiki god appears to be kneeling, this popular style is one of several similar designs from PMP, or Paul Marshall Products. 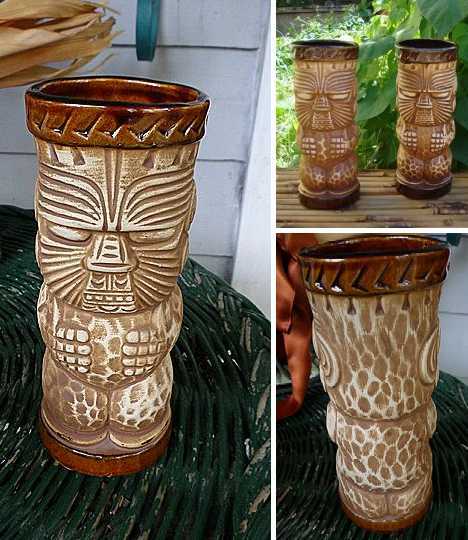 Like the aforementioned Maori Tattoo or Peanut design, this mass-produced and easy to buy in bulk tiki mug is finished in easy-to-grip matte glaze with contrasting glossy glazes on the base and top rim. “Omaha” may sound close to Okinawa but it’s an unlikely place to find South Pacific cultural relics… or is it? Not at all! 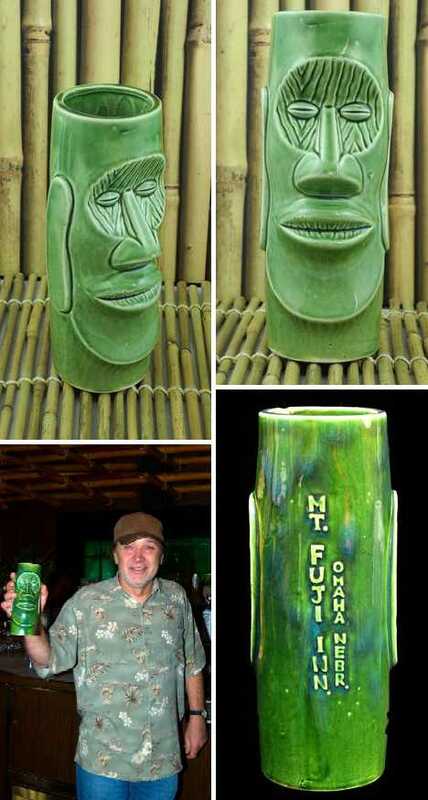 Hundreds of miles from the nearest ocean, Nebraska’s largest city was once home to the Mt Fuji Inn and its Mai Tai Lounge, from whence these jade green Moai tiki mugs came. A massive swath of midwestern America basked in the afterglow of World War II and the boom in all things South Pacific. Take the legendary Kahiki Supper Club, a Polynesian hotspot the graced chilly Columbus, Ohio, from 1960 to 2000. The “Kahiki Mug No. 1” above evoked the mysteries of Easter Island with a nod to classic Hawaiian bamboo carvings. 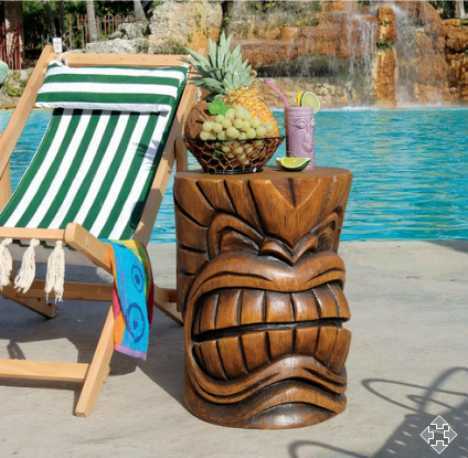 Laugh and the world laughs along with you… including the jolly green tiki mug holding the joy juice! This vintage OMC tiki mug‘s got all the design cues turned up to 11, highlighted by a rich green glaze even The Hulk’s mother would love. Just like Seinfeld’s cookie, black & white CAN get along – remember the cookie! 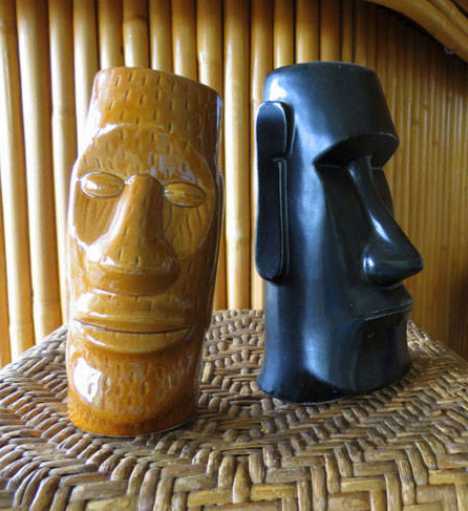 These two variations on the Moai theme evoke the natural look of carved palm wood and chiseled black basalt. Under the skin (glaze, whatever) though, they share the same fired ceramic core construction and hold similar amounts of tropical cocktail goodness. 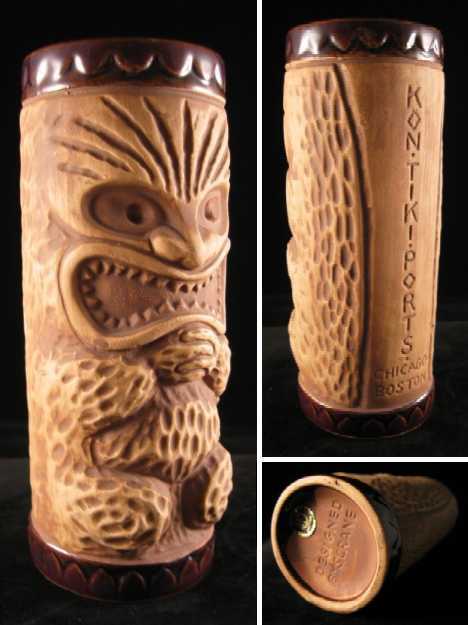 The model R-71 “Ku” tiki mug from Orchids of Hawaii never goes out of style – thanks to its timeless tiki awesomeness! Is it smiling, frowning, or a little of both? Contemplate the meaning of life, love and the motives of the ancient island gods while sipping a nice Hawaiian Punch from this bad boy. He may not have been “The Most Interesting Man in the World” but Stephen Crane led a darned interesting life highlighted (we assume) by a two-year marriage to “sweater girl” actress Lana Turner. Crane’s other Hollywood interest was the Luau, one of the first Polynesian-themed restaurants and a Rodeo Drive celebrity hotspot. Crane later partnered with Sheraton Hotels to create a chain of Kon Tiki and Ports of Call restaurants known for bold tiki tableware (such as the mug above) provided by Stephen Crane Associates. They say once you go tiki, there’s no going back and if you’ve already gone full Hawaiian tropic, the only way to go now is to go big. Take the titanic tiki poolside table above… if you can do it without inducing a hernia. Inspired by the work of artist Trent Smith, this wood-grained designer resin table is the perfect support for a tropic cocktail or two. Now that’s what I call a Big Kahuna!